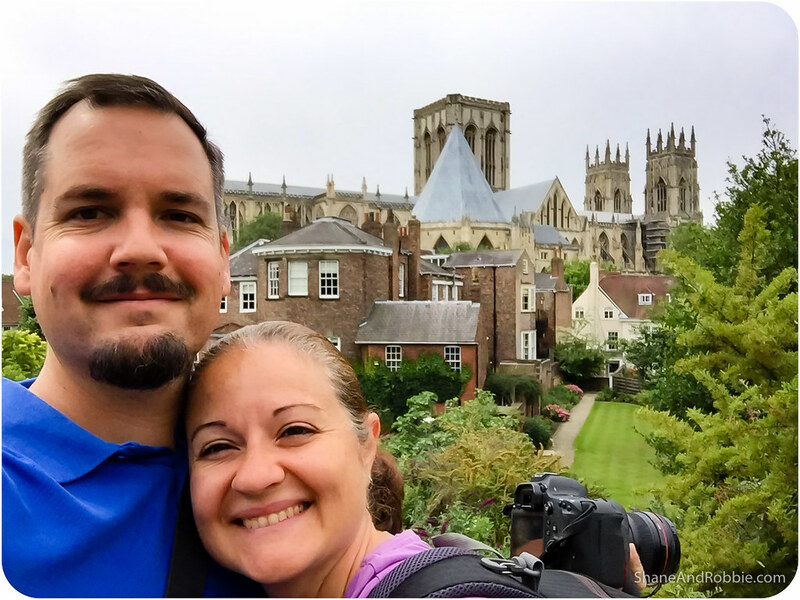 We dedicated our entire day to exploring the grand old city of York today, and it was awesome! This is an old city, with centuries of history written in its winding streets and cobbled alleys. 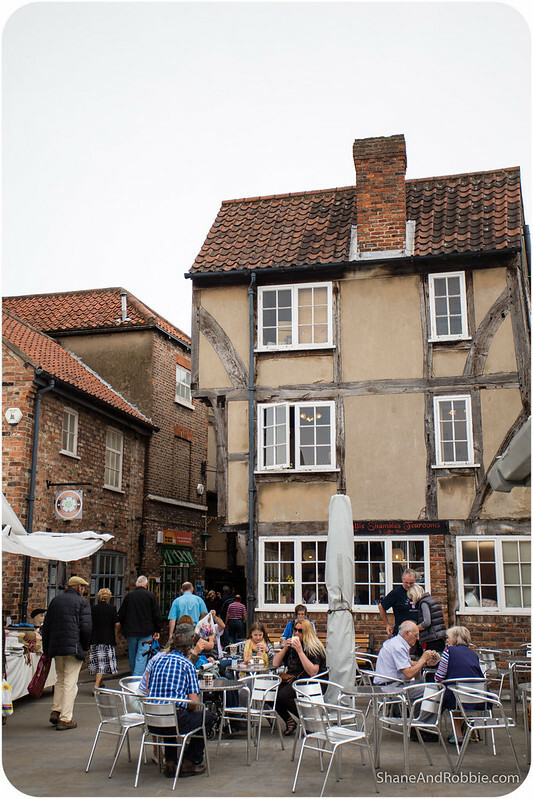 It’s one of the best preserved Medieval towns in England, with a lot of the buildings in the old town dating back to 14th and 15th centuries. Even better: much of the town’s city walls are intact and, as we discovered today, can be walked (very cool). 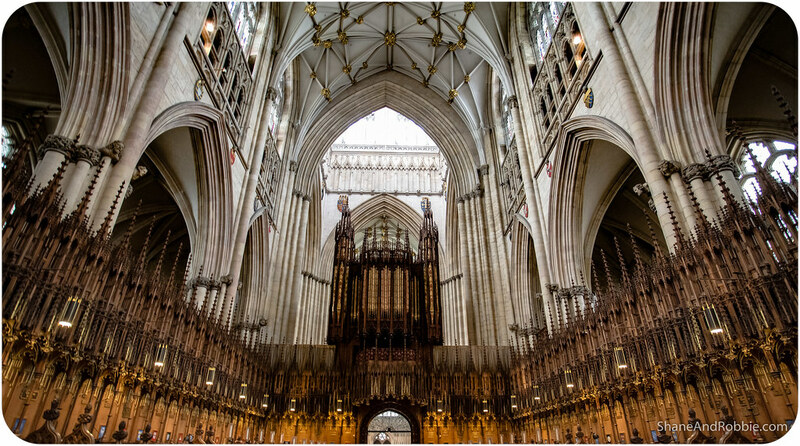 During our travels we uncovered tiny churches and ancient abbey ruins, and got to experience one of the most magnificent Gothic cathedrals in the world: York Minster. No wonder this is one of England’s most popular tourist destinations! 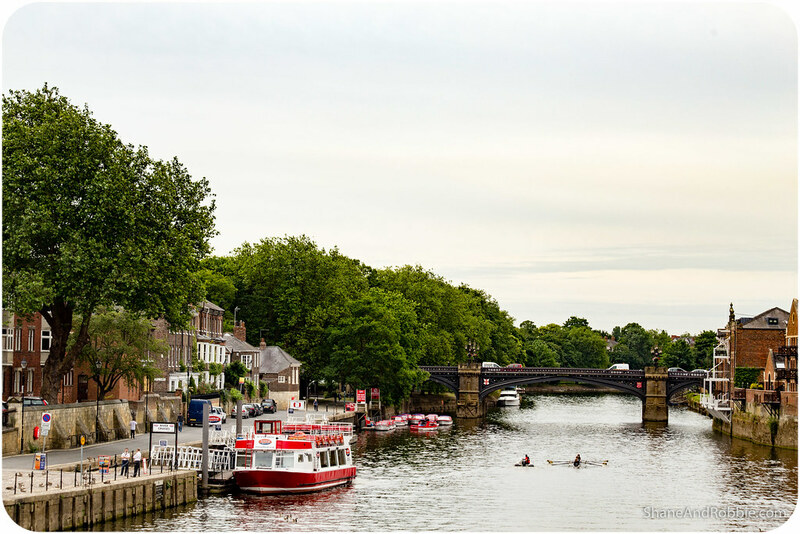 York lies in a valley, positioned between the Rivers Ouse and Foss. At the Yorkshire Museum we learnt that this fertile plain has been inhabited since 8,000BC. When the Celts arrived they built a fortress here, and defended themselves valiantly against the Romans in the 1st century AD. The Romans eventually prevailed however, and founded the city of Eboracum here in 71AD. 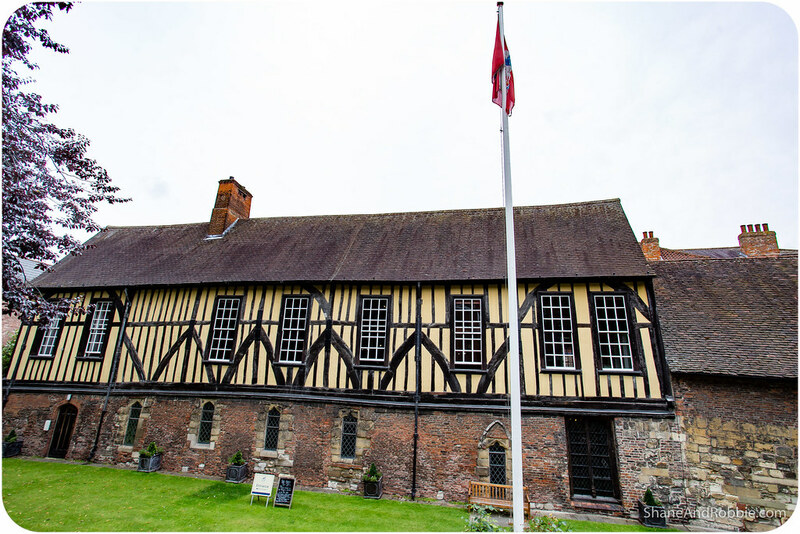 Archaeological evidence reveals that York (as Eboracum) became the capital of the Roman province of Britannia. Little remains of the Roman city today, though excavations in the undercroft of York Minster have revealed the ruins of a large fortress, built to house the main body of the northern Roman garrison. 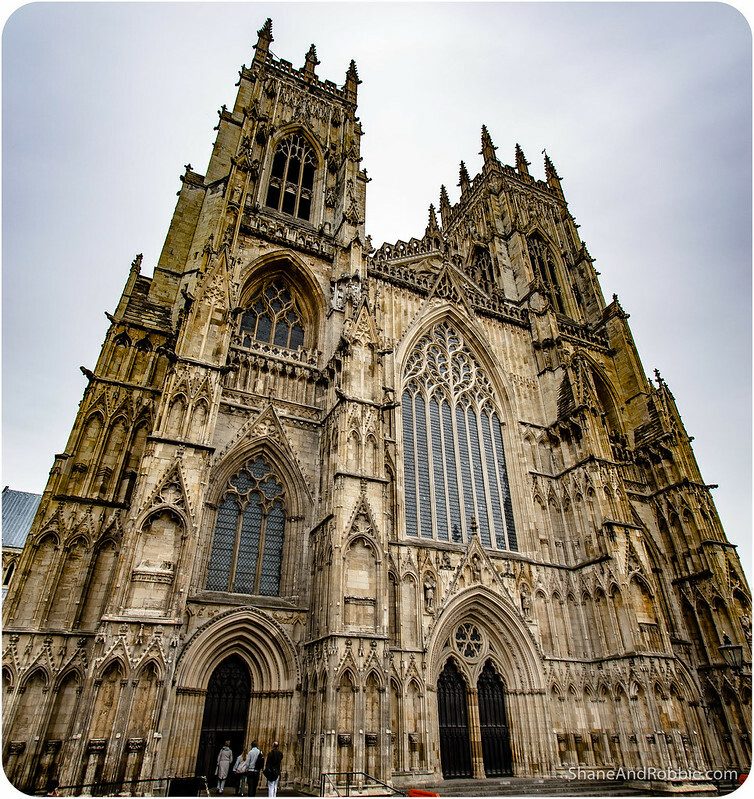 After the fall of the Roman Empire York became the capital of the Anglo-Saxon kingdom of Northumbria, then the capital of the Viking kingdom of Jorvik during the 9th, 10th and 11th centuries. 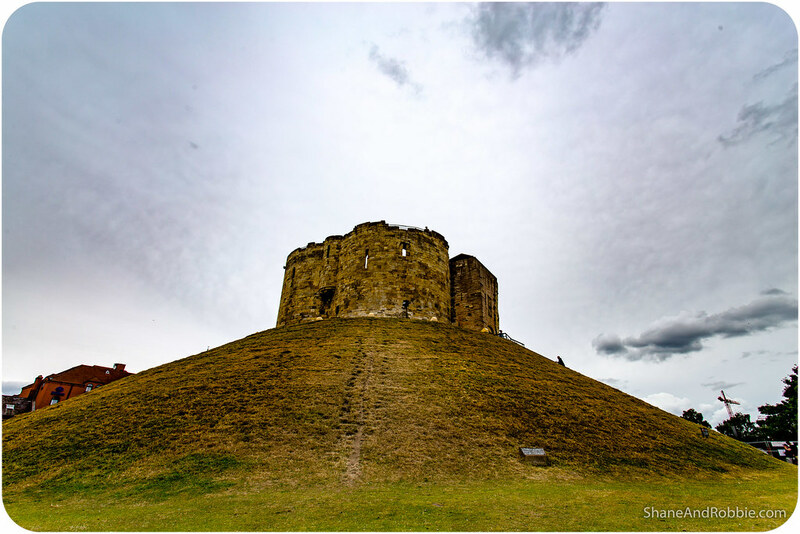 When the Normans invaded Britain William the Conquerer ordered a large fortified castle to be built here to help defend the recently acquired territories. 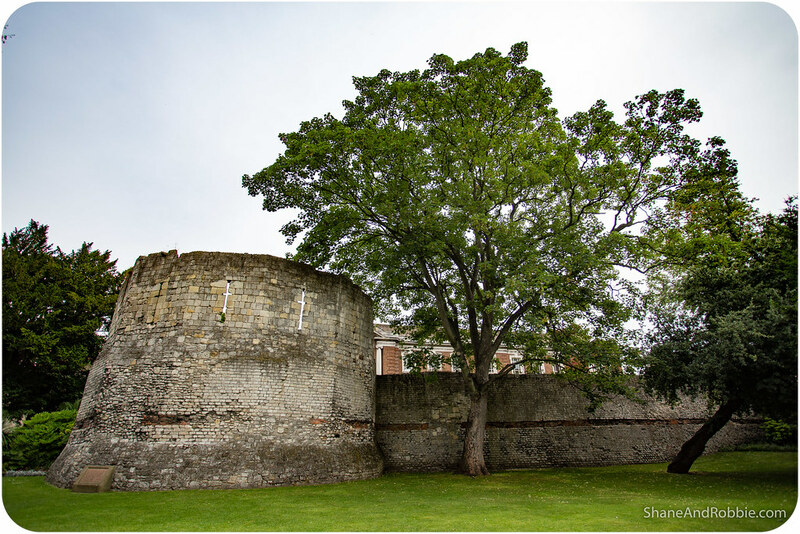 Thanks to centuries of ware and a major explosion in 1684 which rendered the fortress uninhabitable, not much remains of York Castle. We saw the remnants today during our wanderings and were unimpressed – there’s just one solitary tower left standing! 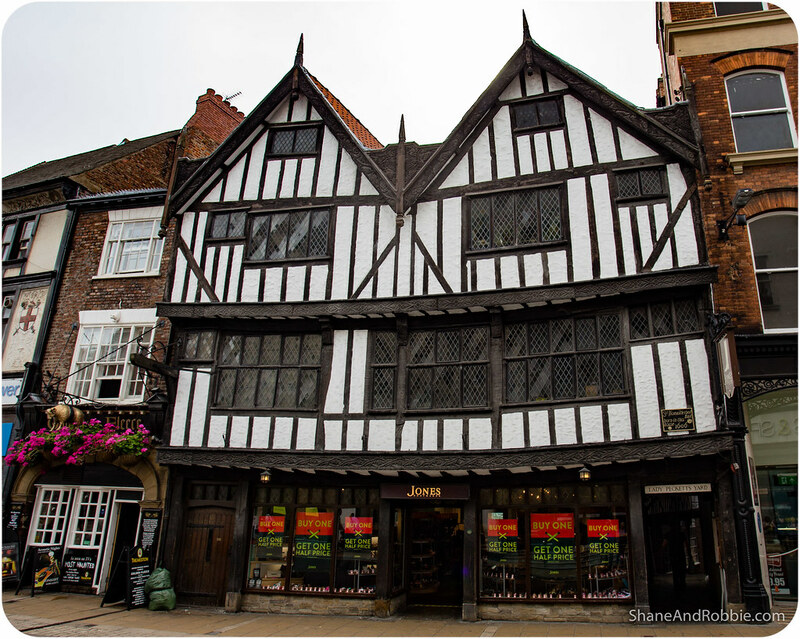 In the Middle Ages, York grew into a major wool trading centre. The city’s location on the River Ouse and its proximity to the Great North Road allowed it to become a major trading centre. Edward I further stimulated the city’s economy by using the city as a base for his war in Scotland. 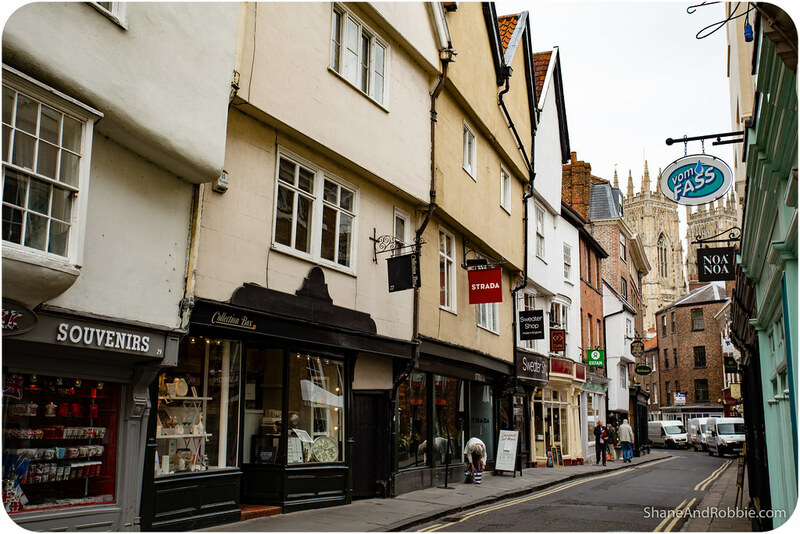 It was during these years that York boomed, and that many of the current buildings in the old town were built, including the City Walls and the town’s amazing cathedral. 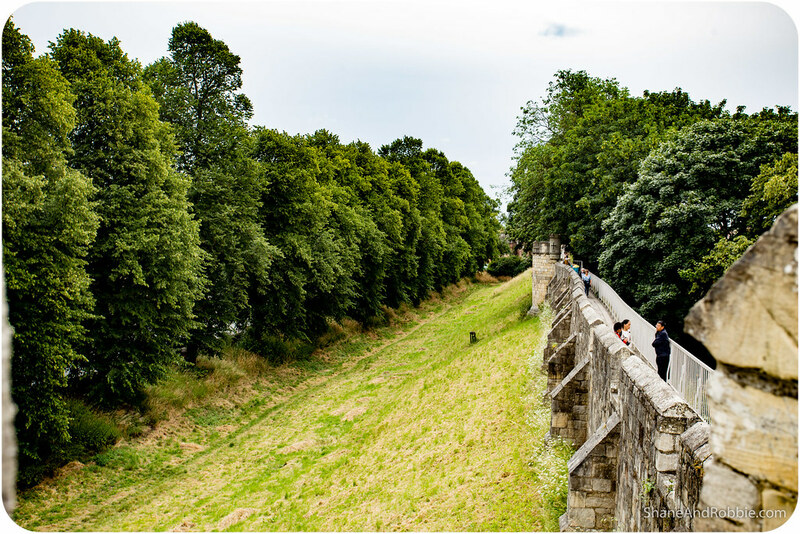 York has, since Roman times, been defended by walls of one form or another. 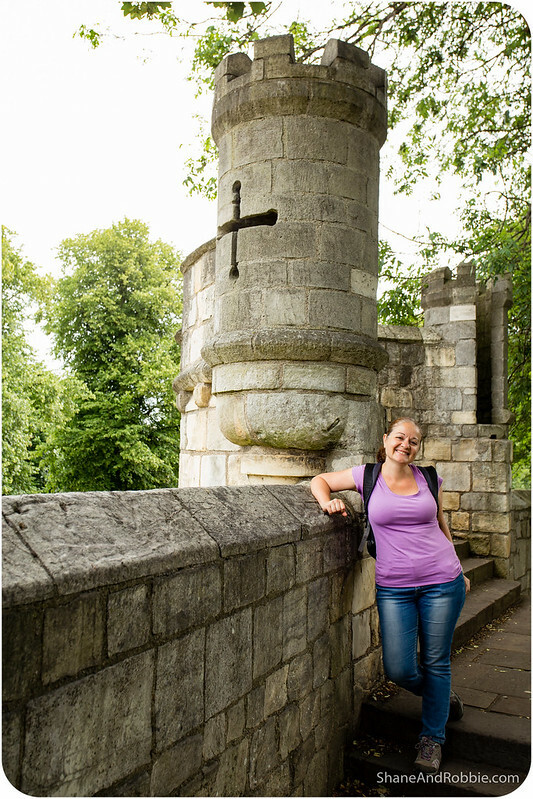 To this day, substantial portions of the Medieval walls remain, and York has more miles of intact wall than any other city in England. Walking along the walls gave us a great view over the town, and an appreciation for the engineers and builders who constructed such a great defensive structure. 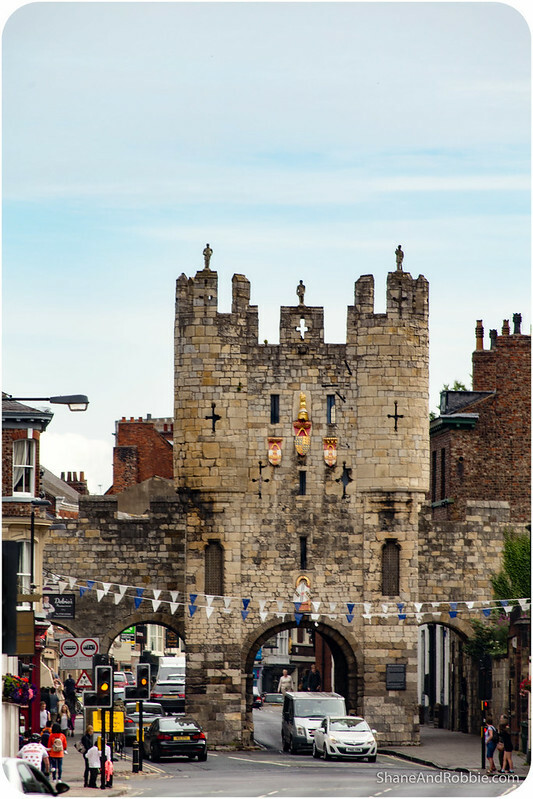 The walls are punctuated by four main gatehouses, or “bars” (Bootham Bar, Monk Bar, Walmgate Bar and Micklegate Bar). These are still standing and were once use to control traffic in and out of the city, to extract tolls from entrants, and to help defend the city in times of war. 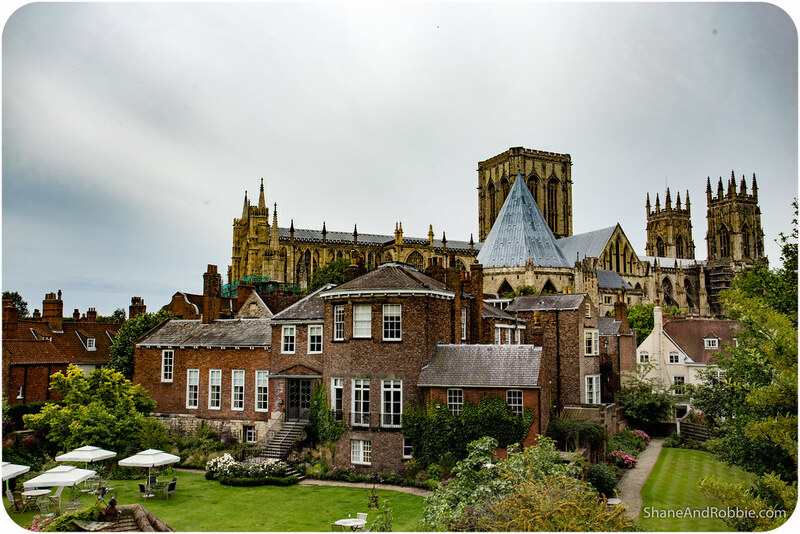 Walking along the city walls our eyes were always drawn to the towers of York Minster*, the town’s main cathedral and one of the largest churches in Northern Europe. 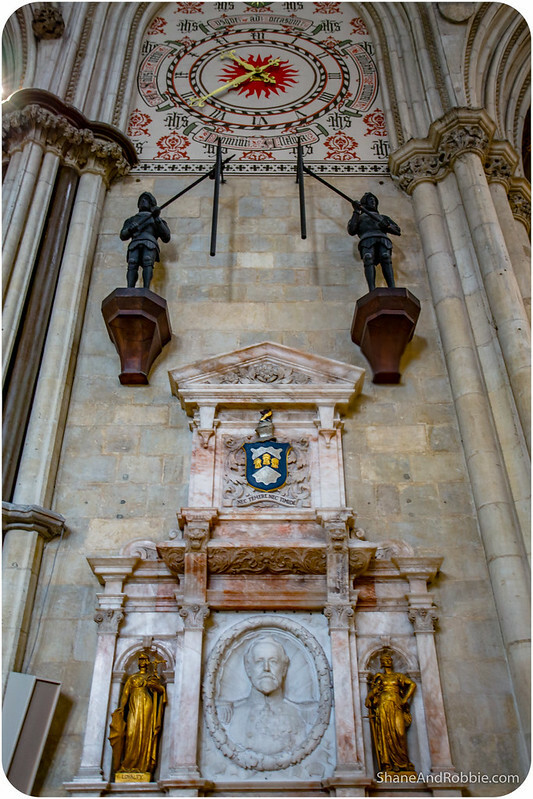 *A minster is a church established in the Anglo-Saxon period as a missionary/teaching outpost. 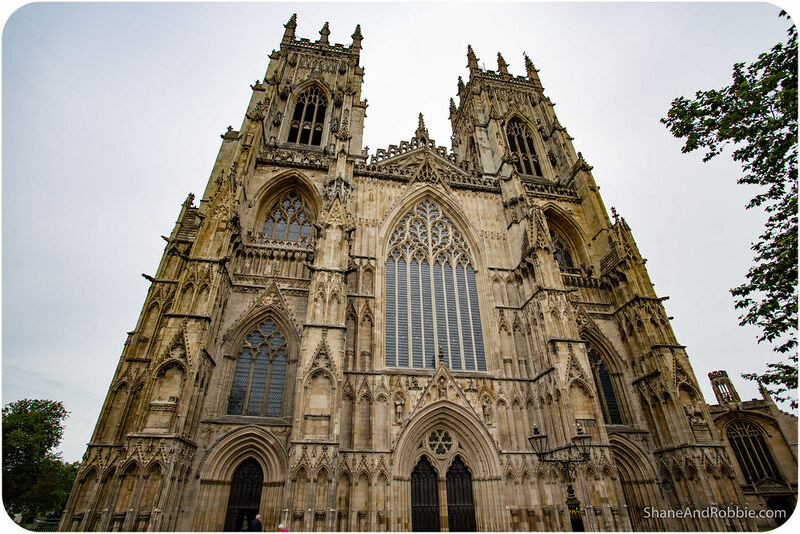 Since the times of Henry VIII, York Minster is the seat of the Archbishop of York, the second-highest office of the Church of England. 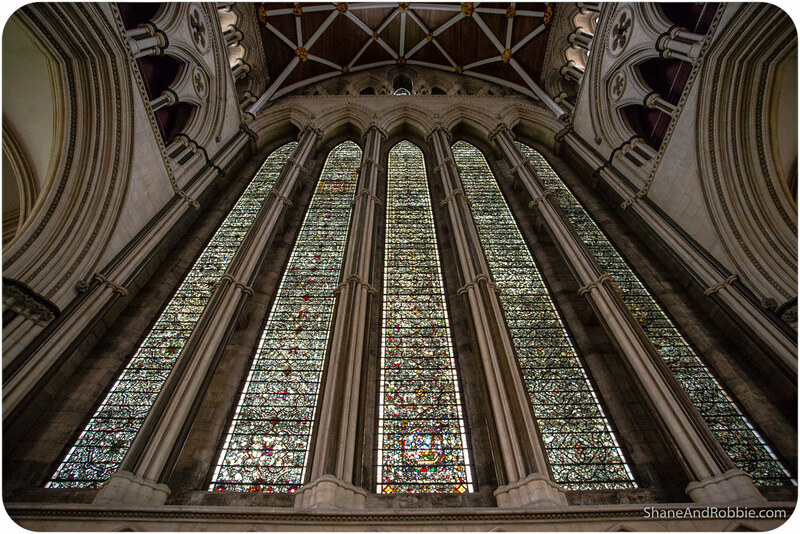 The wealth and power of the religious diocese of York is evident in the cathedral’s size and beauty*. 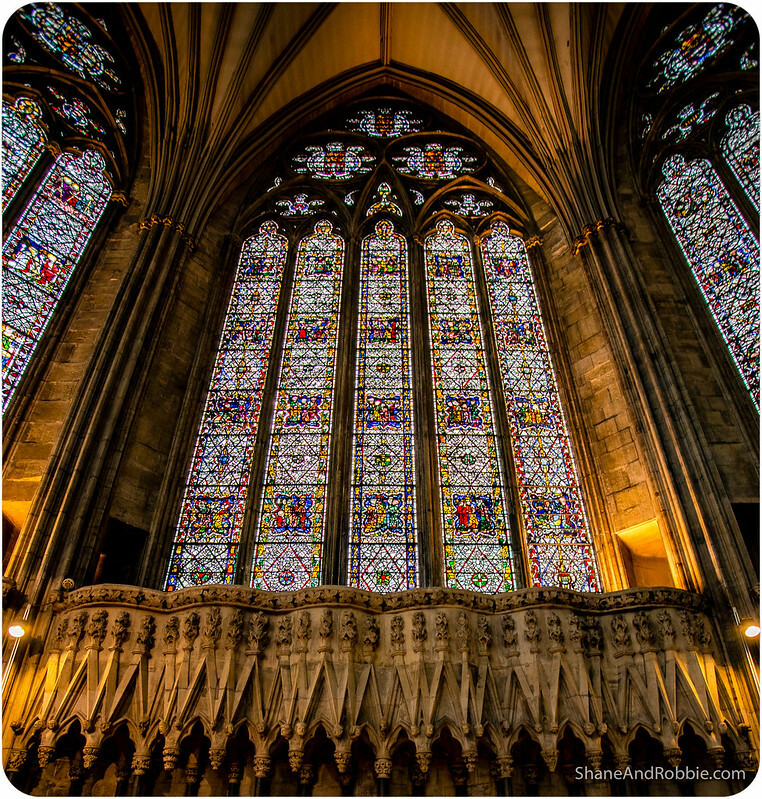 * Under King Henry VIII, much of Minster’s riches were taken away, so we can only imagine how splendid the cathedral must have been before the English Reformation. 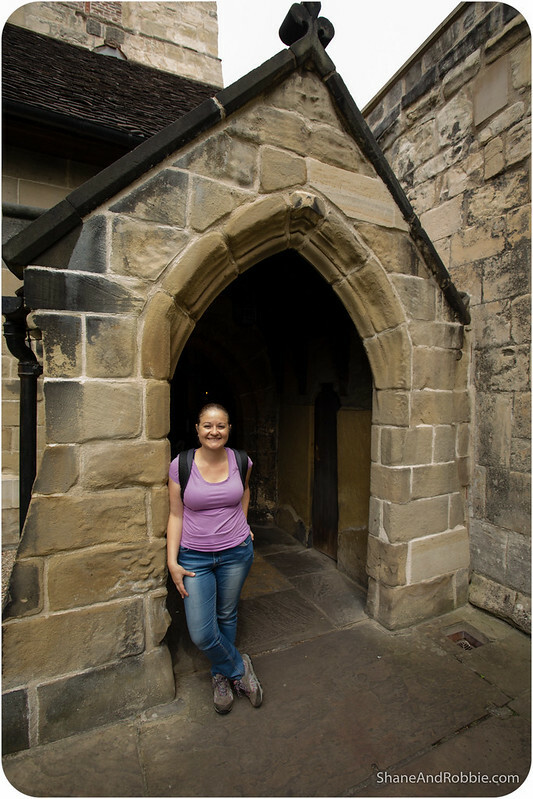 The first church was built at the site in 627, to provide a place to baptise Edwin, King of Northumbria. 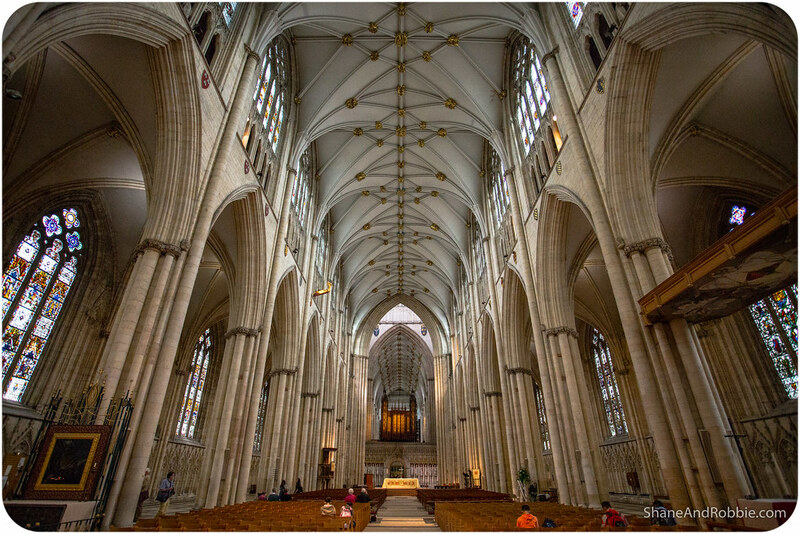 Every time York was invaded, the church was damaged, but was always rebuilt. Finally, in the 12th century, the cathedral was rebuilt for the final time* in the Gothic style of the time. 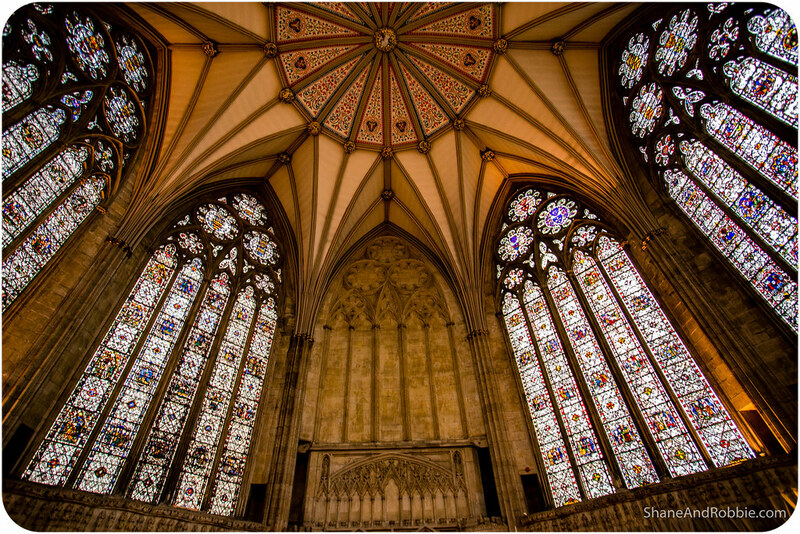 With its pointed arches, ribbed vaults, and flying buttresses, it’s a great example of how beautiful Gothic architecture can be. *It was never rebuilt again, but the cathedral was extended and added to in later centuries however. From the Minster we walked out into the old town and took a stroll down one of York’s oldest and most famous streets: The Shambles. 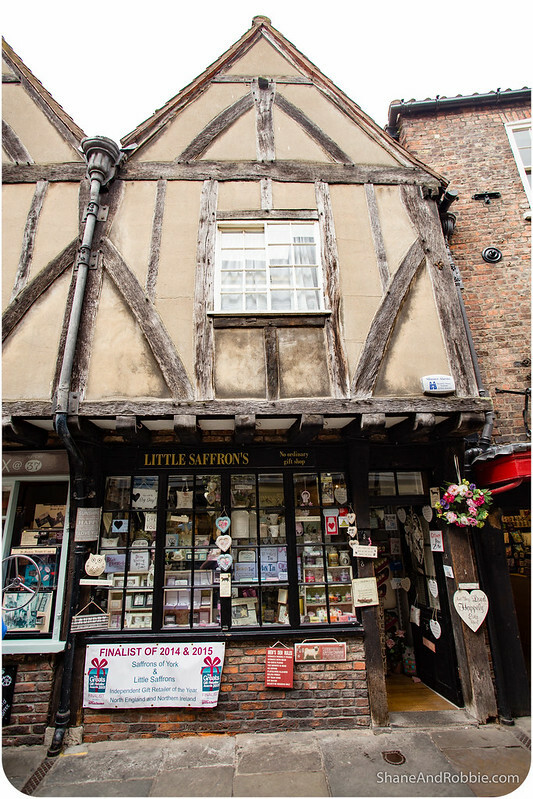 The over-hanging, 14th century, timber-framed buildings of The Shambles are iconic and part of what give York its charm and character. 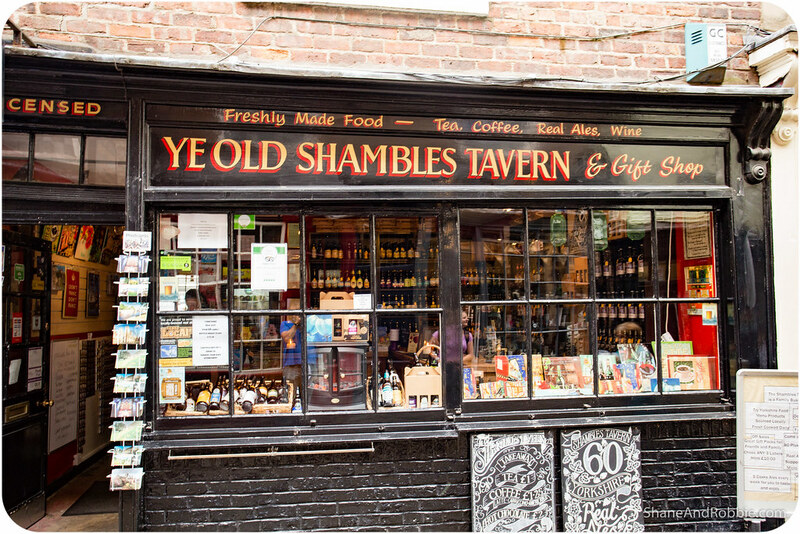 The Shambles was once known as The Fleshammels – literally The Flesh Shelves. Named after the shelves that butchers used to display their meat, the name hints at the street’s origins. The butchers have now vanished, however, and been replaced with cafes and souvenir shops (tourism is big business here in York). 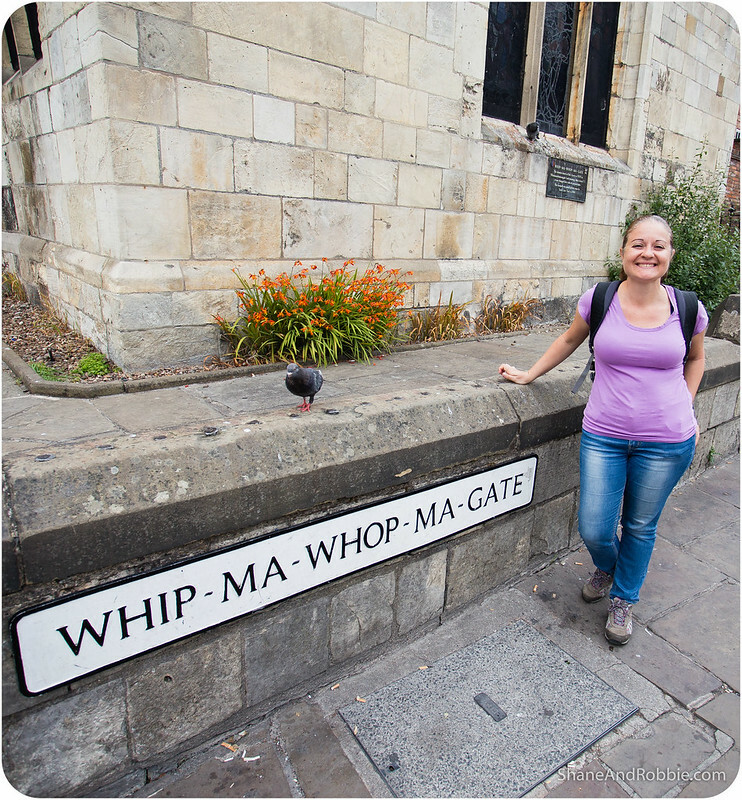 Turning a corner we stumbled across Whip-Ma-Whop-Ma Gate, one of the smallest streets in York. A plaque erected in the street states that it derives from a phrase “Whitnourwhatnourgate” meaning “What a street!” in the Yorkshire dialect, though we couldn’t find out exactly why the street is thusly named, or who named it. Around the next corner we found the tiny Church of the Holy Trinity. Hidden away behind a row of buildings in the old town, in its leafy churchyard, this is one of the city’s oldest churches. 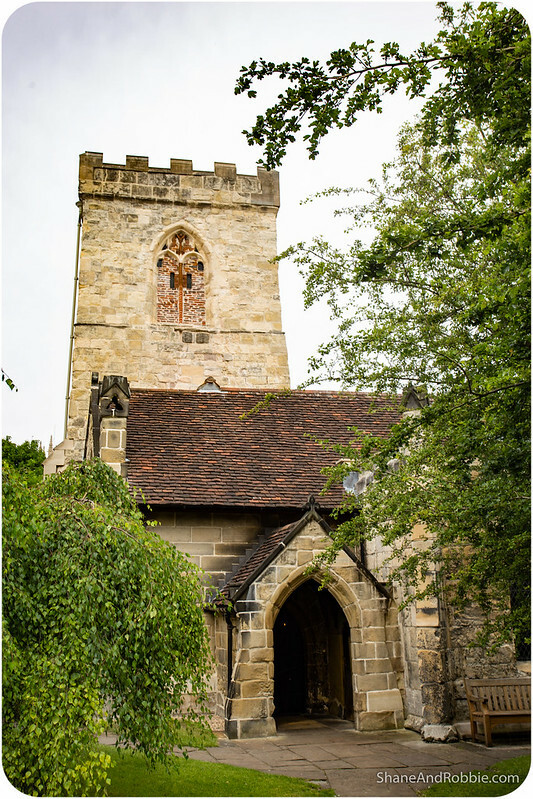 Built in the late 11th century (extended in the 15th century), this old stone chapel still has box pews and original stained glass windows. 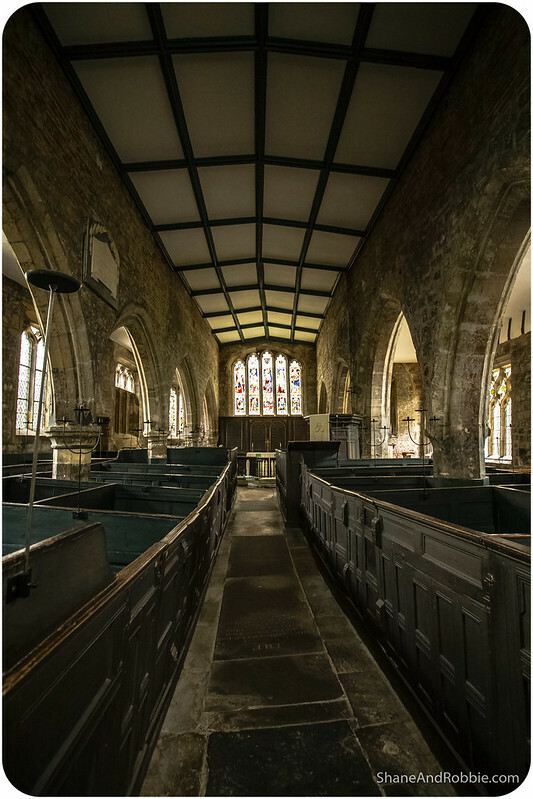 The years have caused the floors and walls to bow and bend alarmingly, but the church retains a wonderful air of serenity about it. We found out today, too, that the American city of New York (and the colony surrounding it) were named after the then Duke of York, who later became King James II. It was THAT Duke of York that was also immortalised in the children’s rhyme “The Grand Old Duke of York” (see below). Seems the verse refers to the day, in 1688, when James II marched his troops to Salisbury Plain to do battle with the armies of William of Orange, only to retreat and disperse them as his support began to evaporate. • Ginger beer was invented here. • Yorkshire Pudding, which is not a dessert but a kind of bread/scone thing, is from these parts. • Nestles used to be based here (they now do most of their manufacturing in Poland) and Kit Kats were invented here. • Yorkies have a reputation for being fiercely independent, stubborn, and friendly with each other, but suspicious of strangers. • The Yorkshire dialect is sometimes referred to as “Tyke”. • Ferret-legging is a Yorkshire tradition in which men would put a ferret down their pants (no underpants allowed), and see how long they could last. With pants tied at the ankles and waist, there was no escape for the poor ferret, and so the contestant would experience the full wrath of a distressed ferret. Doesn’t sound like much fun, but it seems that’s the sort of thing these mad Yorkies do for fun in the winter, whilst down at the pub. 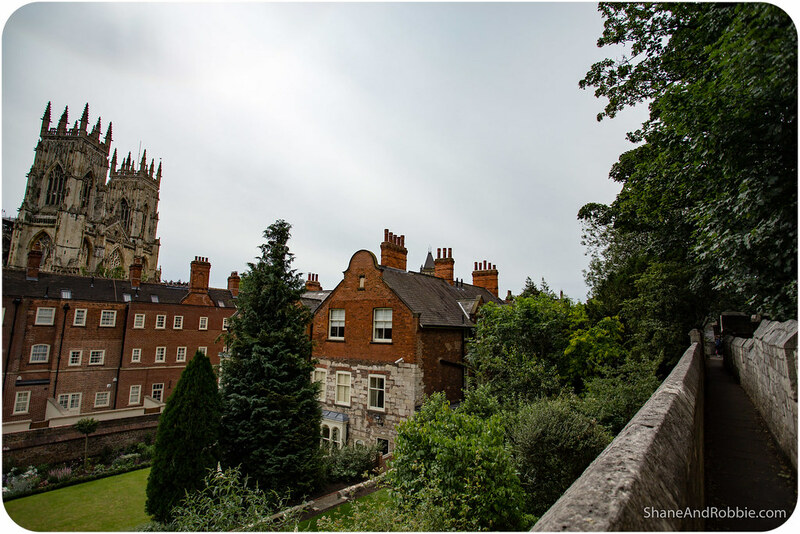 • We love the city of York!